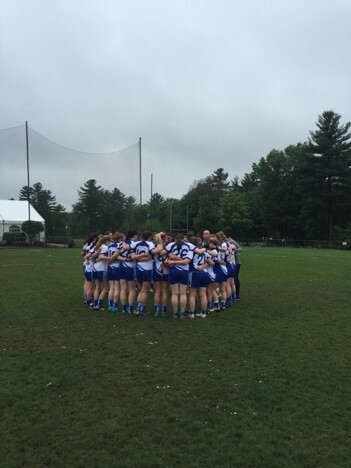 The Connacht Ladies and Boston Shamrocks provided the best attacking football of the day in a hard-fought back and forth battle that wasn’t decided until the final seconds. Connacht came out of the gates flying in the opening minutes, but in a pattern that would repeat itself through the match, the Shamrocks responded in force. Connacht Ladies ready for the game. In the early going, Rose Boyce left two defenders in her wake as she drove straight at the heart of the Shamrocks defense and was brought down. Aisling Reynolds converted the resulting free, then sent another dead ball over the bar to put Connacht into an early lead. But the next five minutes belonged to the Shamrocks as they erased the deficit in no time. Mairead O’Driscoll curled over a fine point and Sarah Jane McDonald added two more in quick succession. The Connacht Ladies jumped back into the lead on the back of a Roisin Green goal. Her momentum took her past the post so she sent a looping shot back across her body, over the keeper’s head, and into the back of the net. The lead didn’t last long as the Shamrocks sent the green flag flying on the opposite end. Caoimhe Murray sidestepped her defender and made no mistake on the finish, blasting a shot into the roof of the net. After another Connacht free from the deadly accurate Aisling Reynolds, the Shamrocks put three more points on the board via Leanne McCrystal. Jackie McDonagh made a brilliant initial save but McCrystal followed up her first effort to poke home the rebound. At halftime the scoreboard showed 2-06 to 1-06 in favor of the Shamrocks. Boston Shamrocks still on track! The second half saw the Shamrock’s Aisling Cunningham resume her midfield battle with Connacht’s Maria Kelly. Both players used height and strength to spark their respective team’s forward endeavors. The Shamrock’s stayed in front for much of the second half, with a fine point from Aoibheann Leahy and a Aoife Darcy goal giving them a bit of breathing room. With ten minutes left, and Connacht playing with 14 players after a high tackle resulted in a red card, the Shamrock’s looked like they were home safe. But Aisling Reynolds wasn’t going to let them away that easy. She stretched to bury a brilliant goal past the oncoming Shamrock’s keeper, and Connacht added another point after winging the next kick out. As the clock ticked down, there was one last surprise turn left in this exciting encounter. The Shamrocks shifted play down to the far end, where Aoife Darcy equalized with a well taken free. Rebecca Morgan sent them into the lead with a curling point off her left foot, and an insurance goal in the final seconds sparked the celebrations for the Shamrock’s, who won 4-10 to 2-12.